It's a good one right?! Like I said above, whether you take small steps or big steps towards your dreams, it all start with that one step. And keep your goals small at first. Have a big dream/goal? Split it up in smaller, easier goals, that way it is alot easier to do and you don't get discouraged by a dissapointment that easily. Keep the bigger picture in mind though, that's always great for motivation. 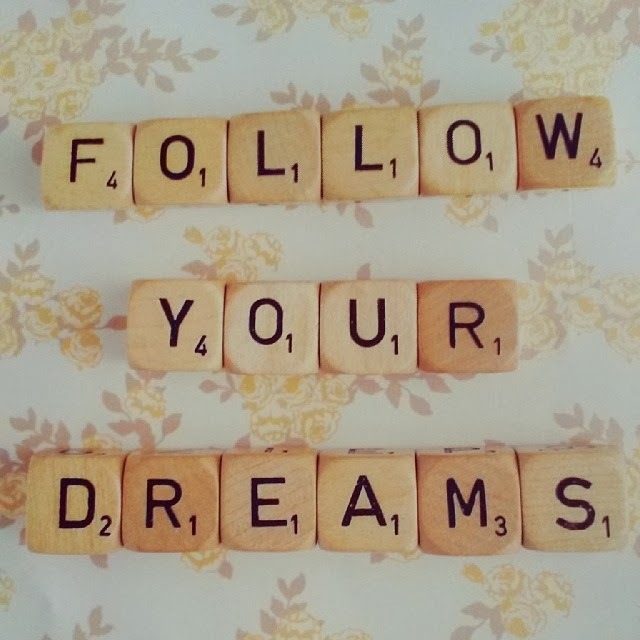 I have big dreams, because what are dreams for if you can't dream big!? I dream of having a house in the country, with some small kettle like chicken, geese and such, maybe even a rabbit or two. I am a lover of nature so I would take lots of walks near my home with my camera in hand. And ofcourse I would have a small tearoom where people can sit for a tea and cake, freshly baked by me! Ow and while were at it, a small plot of land where I can grow my own fruit and vegetables, I would love that! I have always wanted to live somewhere closer to nature, not in the city as I do now. So I know that I will leave here someday. And I have got the baking part down haha. I am getting there....small steps all the way! Happy New Year! I hope your dreams come true. Maybe not this year though, but in general, haha.